Thanks to students from Queen’s Foundation, and members of Church & Peace for visiting the Hub last week. Students from Queen’s Foundation take action on the arms trade. 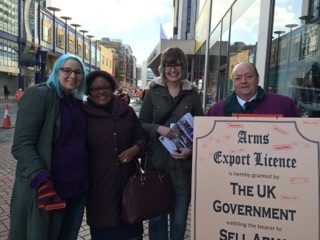 Four students from Queen’s Foundation took to Corporation Street with Peace Hub staff to encourage the public to take action against the arms trade. Braving the cold, they engaged passers by, to explain why the UK must stop selling arms to repressive regimes and help people to take part in a simple action. If you’d like to know more about the UK arms trade and add your ’embargoed’ stamp to our gaint arms export licence, pop-in to Peace Hub any weekday between 11 and 2:30. Members of Church & Peace meeting at the Priory Rooms also popped in to take part in the action and add their support. At Peace Hub we welcome links with other faith groups and civil groups interested in peace & justice, so if you’d like to see how we can work together, please get in touch.